Here is the American Library Association's Call to Action in which they instruct libraries NOT to throw out their books because of the CPSIA. Do you like living in the surreal world as much as I do? I think Big Brother would be very gratified to know that discarding books has become a big issue in America now. Stupid me, I always thought the "dangerous" part of a book is the WORDS - no, in fact, it's just the ink! Apparently I misunderstood why people have been burning books over the years . . . . It's time to contact the Consumer Product Safety Commission regarding the implications for libaries of the Consumer Product Safety Improvement Act (CPSIA). A public meeting was held January 22 with Kristina Hatlelid, Directorate for Health Sciences, and other Consumer Product Safety Commission (CPSC) staff to allow Allan Robert Adler, of the Association of American Publishers, and major publishing companies to discuss the lead content of books. The meeting was a time for the publishing companies to explain their research to the CPSC staff that proves that normal books (non-play, paper books) do not contain lead in the amount specified under the CPSIA. The publishing companies have compiled a group of 300 test results that can be viewed here. After the meeting, Cheryl Falvey, General Counsel for the CPSC, stated that a decision should be made by the first week of February. She advised libraries not to take any action at this time, and we are hopeful that the Commission’s decision will exempt libraries. Even with her assurances, we must let the CPSC know how important an issue this is to libraries. You can visit their Web site, found here, to submit your comments to the Commission. Explain to the Commission that it is simply impossible for libraries to remove all children’s books from the shelves and/or ban children under 12 from the library and still provide the level of service that is needed. Please feel free to use the sample language here, but personalize it to make your comments known. Studies have shown that individual letters are significantly more effective than form letters, so let’s make sure they understand how important their action will be. As always, thank you for all that you do. The only way we will be successful in ensuring that children will have access to safe books is with a strong grassroots effort. Your comments to the CPSC need to be submitted as soon as possible, so please tell all your friends and family – we need as many people as possible to communicate that this oversight could have lasting ramifications on our children and our communities. Please note: the reasoning embedded in this list is that it will all be granted, thus some additional points which are important are implied in the list. I assure you that I would never attach my name to any suggested change to the CPSIA if I felt, even for a fleeting second, that any aspect of my suggestions would degrade safety in children's products or lead to any injury. Safety, to me, is only a sidelight to the issues in the CPSIA. The big issues relate to the law's structure, not its intent, and the very negative effects flow from the distortions in incentives and practice caused by its many rules. a. A Pause. We need a stay of enforcement or a delay in the implementation dates for the new standards until at least 180 days AFTER the CPSC has published and finalized its implementing rules and regulations. Many people are asking for a six month delay but this overlooks the activities that will take place in the next six months, namely rulemaking. In reality, even this proposed delay may not be enough as the period between final rulemaking and implementation will result in a huge surge of activity that eill likely swamp available resources all throughout the "food chain". Unfortunately, the CPSC has issued very few implementing rules at this point, even defining what "total lead" is or how to test for it. This is causing incredible chaos. The "pause" will allow for more discussion about the details of the law, public hearings and a legislative process that might result in structural repair of the law. The National Association of Manufacturers has filed a formal request for a Stay of Enforcement signed by 67 assocations, with more associations expected to join the letter shortly. b . No retroactive effect for the new lead standard. The retroactive effect of the CPSIA's new lead standards is creating massive dislocation. Companies have NO WAY to fix compliance issues with existing inventory which are usually technical in nature but may cost literally hundreds of thousands of dollars per item to fix. Retroactive effect will create a number of terrible problems: (i) huge costs for voluntary recalls of products that pose NO threat of harm to children, (ii) a subsidy to companies who are oblivious to the law, speculate that the law will be repealed or revised later, or who are intent on flagrantly disregarding the law, (iii) may drive many companies to openly disregard of the law, thereby creating a growing trend to disregard safety laws generally, or (iv) widespread business losses, closings and/or job losses. Elimination of the retroactivity effect will considerably reduce the pressure on the thrift store industry, as well as libraries and many other affected enterprises with large inventories of existing product. c. Age range in the definition of Children’s Products should terminate at six years old. The broad sweep of the definition of Children’s Products under the CPSIA is causing widespread harm, and will dilute the efforts of the CPSC to patrol the marketplace. The risk to children from contact with children’s products sharply diminishes when children stop mouthing toys and other objects. The CPSC has determined that mouthing ends at three years old. There is no support for the notion that children are exposed to dangers from mouthing over three, so a limit of six years of age provides an appropriate margin of error. Elimination of products intended for children seven and over will greatly reduce the scope, and harm, of the CPSIA, as well as significantly narrow the categories of products affected by the law. d. The Total Lead Standard should be abolished, and pre-sale testing should be limited to Lead-in-Paint. This change is in recognition of the fact that lead is known to be dangerous in some circumstances, but is not known to be dangerous in other circumstances. The way to properly administer the marketplace is to (re)empower the CPSC to identify safety issues as they arise and develop rules for such issues without limitation. The CPSC with its considerable scientific resources and devotion to mission is the right place to make these determinations, not Congressional committees with no such resources. See https://mail.learningresources.com/exchweb/bin/redir.asp?URL=http://www.forbes.com/2009/01/26/toys-lead-cpsia-oped-cx_phr_0127rubin.html. Implementation of this rule would, for instance, let the CPSC tighten up rules on children's jewelry if they felt it was needed. The need for, and the reach of, any “total lead" standard should be assessed by the CPSC on a risk-assessment basis, and should be implemented by the CPSC in its best judgment subject to appropriate public processes. I would note that the 2007 recalls related to Lead-in-Paint, not “total lead”. This is a critical point that Congress has refused, categorically, to acknowledge or consider. Elimination of pre-sale testing on "total lead" should also explicitly exempt pre-sale testing on phthalates. Whatever standards remain on the books should be the responsibility of manufacturers to comply with, not to prove up before sale. e. Lot Marking Requirement is Eliminated. This extremely expensive and burdensome requirement is intended to ease future recalls. Yet, future recalls are supposed to be well-contained by the other provisions of the CPSIA. [Have we found a logical problem here, perhaps?!] The lot marking requirements promises to be a crushing burden on non-mass market-oriented companies and will likely result in (i) reduced product diversity, (ii) abandonment of niche markets and specialty markets in favor of the mass market, and (iii) sharp elimination of jobs and economic opportunities for small and medium-sized companies. I believe this one provision has the greatest potential to downshift product innovation among small and medium-sized companies and must be amended urgently. f. Effective Pre-emption. Effective pre-emption of state law on children’s product safety and the further restraint of State Attorneys General from enforcing (or effectively competing with the CPSC in the enforcement of) the CPSIA is essential to preserve efficient inter-state commerce. There are many developments brewing as we approach the dreaded "National Bankruptcy Day". I hear that large inventory write-offs are about to be announced by certain public companies under pressure to remove product from store shelves by their mass market retailer customers. This "war" between suppliers and retailers has long been predicted in my letters and in this space. As enormous piles of money gets shamefully shredded, presumably leading to significant job losses at manufacturers, their factories and their downstream retailer-customers, we can only hope Reps. Waxman and Rush are satisfied with their handiwork, making America "safer". It's all worth it, right? In the dreaded news category, we are also hearing about increasing informal recalls of product ahead of implementation of the new standards. "Recall" may be too harsh a word for it, but by hook or by crook, companies are retrieving product from the marketplace, and then either reworking it or trashing it. The author remains confident that these actions are entirely motivated by legalities, not by any social conscience or any shred of evidence that the products in question are dangerous. Having been raised to treat money with respect and because these days it's clear that money is a limited resource, I regret such waste, but even more, I regret the implication of such informal recalls. I feel that these recalls will be taken by the marketplace (dealers and consumers) as some form of implicit acknowledgement that there was a serious safety problem in the first place. It is natural that anyone seeing sophisticated companies acting in such a broad and panicky fashion would draw this sad conclusion. This will make our opposition more difficult as it will feed the resolve of supporters of the CPSIA to hold their ground, and will likewise whip up fear among the most skittish consumers. Sadly, there is nothing we can do but watch helplessly - every such recall will hurt, both financially and dynamically, making us all look bad for no good reason. The pendency of the new standards makes me think about how much safer we will be in a few short days. Obviously, the new standards are in our best interests, otherwise why would wise Congress take these draconian steps if not to protect us! So, if these standards are needed to protect us, I wonder how it is that we have survived this long without such necessary protection. It's certainly true that children have been checking books out of libraries for many, many years with only paper cuts to show for their reckless behavior. And thrift stores have sold children's clothing and strollers for years without incident, but apparently no one knew the "dangers" that lurked within. Indeed, all of these items have been considered safe until February 10, when magically they will become unsafe unless proven otherwise. Let's focus on the last six months, when we all began to adjust to the new standards. If there was such a raging safety problem, why did recalls abate in 2008 (versus 2007)? The new standards were not in place in 2008 . . . . Why aren't we seeing many claims of injury from all the dangerous children's products still legally available in the market? Even more to the point, what about the ten zillion products already sold and in use in the United States? Surely the population of existing product already sold is enormous, dwarfing the inventory in the supply chain at any given time. Shouldn't we be seeing outrageous injury statistics right now, currently, that would only abate over time as the population of "safer" products slowly overtakes the quantity of older product in use by children everywhere? Hmmm. I don't recall seeing any such statistics or notice of such injuries anywhere. Any idea why that might be? Here's a theory: There never was a problem with children's product safety. While I, and everyone else, regrets the death of one child from a lead jewelry bangle, that one tort does not mean that everything made for children was defective or that each American business catering to children needs Big Brother watching over its shoulder to ensure "safety". If safety really was a problem, there would be a problem TODAY, right now, and NOTHING in the CPSIA could change that fact for years - unless the law made the product already sold illegal and required its immediate disposal (which it does not). In other words, plainly, the "dangers" that the CPSIA intends to "cure" once and for all, never existed and don't exist. Imaginary problems are best solved with imaginary cures. Unfortunately, the CPSIA is real. As we march resolutely forward against an immovable Congress, I ask "who is defying whom?" I have been writing Congress about this bill since July. We know that my original letters went unread by the principals - they EACH admitted that fact to me freely in November, and nary ONE of my many subsequent emails on the CPSIA have been answered. Those of us who oppose this law hold views which are unwelcome in certain quarters of Congress. We stand in opposition to the self-righteous consumer "advocates" who promote a rigid and unthinking "take no chances" approach to safety and who openly state that the bill cannot be reopened, as though they are now the Moms of the nation ("no more cookies for you, Young Man!"). The more we are disdained, the more I feel ostracized and excluded from a critical national debate and function. So I ask - are we defying them, or are they defying us? I used to think this was our government. I used to think government officials collected paychecks which we paid with our tax dollars, that they work on our behalf. Yet, when their handiwork is criticized, they tell us to go away. They act as though they are an entity unto themselves, rather than an organ of OUR government. Rachel Weintraub, senior counsel for the Consumer Federation of America and a leading adviser to the bill's authors, instructs in a recent Bloomberg.com article that ‘[t]he answer is not to reopen the bill.” I see. They know what's best for us; by opposing their law, we are defying them. a. Sales are down sharply at a wide range of companies selling children's products. I have heard from many of you about disorder in your markets. I know from my customers that fear, distrust and uncertainty is running rampant. The government (and Rachel Weintraub) is telling us we can't trust anyone - so we don't. b. Companies are now starting to informally remove product from the market - not because they are certain that these products create a health hazard or because they know they violate law. In fact, that's not possible since the law is not settled - there are no implementing rules or testing standards for "total lead". Actually, "total lead" is not well-defined at all. So why are these pseudo-recalls occurring and why should we care? They are occurring because companies are running scared and feel they can reduce prospective costs by "taking no chances" now. Why should we care? This activity not only wastes vast amounts of money and resources, but also scares the willies out of the market. It suggests that we ACTUALLY HAVE SOMETHING TO FEAR. Is Rachel Weintraub right? Heavens no, not even close, but these recalls make her look "right". This is catastrophic on many levels. c. Many companies are jumping to the 300 ppm total lead standard now, in anticipation of the August standard. This is virtually required by the September 12 retroactivity opinion of Cheryl Falvey, and totally eliminates the Congressionally-granted sell-off time between February 10 and August 9. This further confuses and alarms the marketplace. Should everyone be scared? It looks like it. Thanks, Congress! d. The Waxman and Rush House Committees have refused to call hearings on the CPSIA. Their proposed hearings in December were suddenly cancelled and no further hearings have been scheduled, despite the calls of Reps. Barton and Radanovich, the ranking Republican members of those committees. One reason to not have hearings is to keep me, and to keep you, off the record. If there are hearings, they will be taped and put up on the web for all to see. Snippets can go up on YouTube. That might be . . . embarrassing for some people associated with the law. People who testify can put written testimony in the public record without their having any ability to review it or change it. Remember that little thing called Freedom of Speech? The written testimony, which the committee must post online, will be an invitation for a suddenly interested Media to ask questions. No one wants that! The only way to keep the mischief makers out of the record is to have no record at all. No, we are not defying them - they are defying us, and in so doing, are defaulting on their responsibilities as Congressional committees. If their policy is so strong and so protective of our interests as members of our community, why not respond to the critics? Why not hold hearings? Is the right way to respond to rational criticism to say that the bill will never be reopened, and we should all clasp hands and blame the CPSC instead? I think not. Write your Congressman and DEMAND that they reach out IN WRITING to Reps. Waxman and Rush, and Senators Pryor and Rockefeller, with cc's to Reps. Barton, Radanovich and Senator Kay Bailey Hutchison, to request urgent hearings on the serious issues raised about the CPSIA and further, to implement an immediate stay of enforcement of the law for at least six months after final implementing rules are promulgated by the CPSC. By hitting the "pause button", Congress will allow for an orderly process to consider the issues on the bill and to define the appropriate corrective action after due public debate. They need to hear from you - on the record. Thanks for putting the editorial spotlight on the new lead in children's product legislation passed by Congress last year ("Pelosi's Toy Story," Review & Outlook, Jan. 14). The sad part is that adequate federal law existed to stop the import of Chinese toys containing lead, the importers simply did not obey existing law. Now comes the silly part. The prior law was based on toxicology (how much lead can be extracted from the children's product through use or abuse). The new law only considers total lead in the product. And the maximum allowable lead content starts at a very low level, and keeps getting smaller in future years. Many metals, metal alloys, and a wide range of other materials are perfectly safe and comply with the earlier law, but will become "banned hazardous materials" on February 10. The new legislation covers "all products designed for children under 12 years old." The crowning glory is that all children's products now need to be tested for lead content. By the way, did you catch that this means all children's products in existence on February 10, not just children's products manufactured after that date? Put it all together and we have a spectacular example of incompetence. For example, elementary schools are designed for children under 12 years old. Does this mean that everything inside the school, and all of the construction materials used to build the school, need to be tested for total lead content by February 10? What about library books? The Consumer Product Safety Commission can make exclusions, but the law is very broadly written, allows no phase-in time, nor does it grandfather previously made products. The law says "The Commission may, by regulation, exclude a specific product or material from the prohibition . . . if the Commission, after notice and a hearing, determines on the basis of the best-available, objective, peer-reviewed, scientific evidence that lead in such product or material will neither -- result in the absorption of any [my emphasis] lead into the human body . . . [OR\][or] have any other adverse impact on public health or safety." This doesn't seem to give the CPSC much wiggle room. All products and materials that exceed the total lead content will need to be disposed (a few examples of these banned hazardous materials include bicycles, desks, ballpoint pens, chairs, computers, and HVAC systems). It will indeed be an early (and very long) summer break for our children. Thank you for highlighting this issue. We are a small Washington, D.C.-based manufacturer (probably the only one) that will likely be compelled to close our doors because of this legislation. The minimum cost for testing our products -- harmful items such as headbands -- would be triple our gross revenue. As a result of this law, only the Wal-Marts of the world will continue to exist. The opportunity for individual expression or individual initiative will be permanently quashed. Let's hope that Congress can do the right thing before hundreds of thousands (or millions) of quite small businesses go under as a result of this crushing and utterly unrealistic legislation. Congress has ignored dire warnings and turned a deaf ear to rational criticisms of its work in the past – and today repeats these errors in its resolute defense of the indefensible CPSIA. And, as time goes by, it becomes clear that the CPSIA is doing the work of a modern-day equivalent of Smoot-Hawley, rapidly creating a depression on the children’s product industry and laying waste to economic activity and jobs throughout the country with its sudden imposition of incentive-distorting costs. No doubt, the proponents of the CPSIA have their reasons for defending the structure of the law, but fail to take into account the economic impact of the rules they so strongly support. Every rule represents choices; in this case, any notions of “improved safety” will come at a high cost. Are these costs worth their consequences? Congress opted to legislate the “bubble-wrap” childhood where no risk can be tolerated regardless of cost or the nature of the safety threat. This approach is endorsed by consumer advocates without responding to the substance of objections to the CPSIA: “’This law passed because our product safety net was broken,’ said Rachel Weintraub, senior counsel for the Consumer Federation of America, a nonprofit organization based in Washington. ‘The answer is not to reopen the bill.’” http://www.bloomberg.com/apps/news?pid=20601087&sid=aDLzWS6FBwRo&refer=home. Under this world view, no criticism of the CPSIA can justify its reconsideration – the end justifies the means regardless of what the consequence of those means might be. As we in the Children’s Products industry suffer severe economic hardship and face the prospect of a law that cannot be complied with, we beg Congress “almost on [our] knees” for revised, rational rules focused on real safety issues. A laundry list of imaginary safety issues, like dangerous cotton t-shirts, edible library books or lead-infused shoe soles, are just too expensive to eliminate in a pinched economy. We are good citizens, the same as the consumer advocates, and are just as committed to safety. However, the economic policy advocated by the consumer groups as embodied in the CPSIA will not work – and if not arrested quickly, will do lasting damage that will not be easily repaired. With Mr. Obama now in office, having instructed us with his "Let's Change America" slogan, I am energized all over again to attack the vindictive and misguided CPSIA before it's too late. February 10 is a mere 21 days away. The government has only three weeks to come to its senses. Do you realize that the CPSC has received literally thousands of requests for advice, rulings and clarifications and answered only a tiny portion? Implementing this law with so many points unresolved (and unresolvable) should be considered a crime. Today, the Obama administration ordered a halt in all rulemaking, echoing a move by the Bush administration in January 2001. It would be foolish to believe this was intended to help us, but it may in fact have that effect. If this Executive Order clogs up the CPSIA pipeline, then there may be no choice but to hit the "pause" button. In the meantime, as this gets more urgent by the second, please write Congress and call your representatives every day to tell them what you think. This matters needs urgent intervention. Right now, I am cleansing my mind by attending a business class. So, while Rome burns, I am not fiddling but I am trying to think "Big Thoughts". Yesterday, we discussed a car company with a big customer service problem (hmmm). In particular, they had several customers who were very angry over car quality problems - what should the car company do? Well, the car company wasn't too motivated about helping these customers because (a) the customers were deemed whiny and "professional complainers", and (b) the car company's Customer Service folks were very focused on how hard they worked to provide service and their implementation of a wonderful "Red Carpet" warranty program and generally preferred to talk about how well-intentioned they were. Our instructor informed us that most companies tend to assign negative attributes to people who complain (e.g., "whiny") rather than deal with the substance of the issue, and that 75% of all companies eventually "calcify" against their customers. What a terrible statistic, and even worse, what a terrible result! It gave me a lot to think about, as we pride ourselves on our strong relations with dealers and our consumers. But it also made me think about the CPSIA and our evolving relationship with Congress. Has Congress calcified against us? Are they no better at listening than the hypothetical car company? It's an interesting question, isn't it? Having reflected on this question, I say the answer is no - and yes. In fact, your screams have been heard, and Congress is acting. The people who are listening and acting, however, are your representatives. These are the people who have no "skin in the game", the ones who are Government by the People and For the People. Their job is to listen to you and to help you when you need it most. However, not everyone is listening, and there are strong signs of calcification in Congress toward us in some critical quarters. The authors of the bill, as evidenced by the January 16th letter to the CPSC, seem to be deaf to our arguments and pleas. The data and other information you brought forward have only elicited a letter insisting that the law be conservatively and rigidly implemented as written. The January 16 letter indicates an unwillingness to compromise and appears to be an attempt to prop up (justify) the CPSIA rather than acknowledge its defects. As we know from observing American car companies, this strategy can have tragic consequences. . . . The moral of the story has yet to be written. If Congress remains self-satisfied and unwilling to contemplate its errors, if they refuse to surface their problems and instead focus on justifying their processes and their defective law, the results are predictable and inevitable. The House and Senate leadership need to wake up to the reality of this law. Safety can be achieved through more rational, less penal means. They need to figure this out before it's too late. It's time to hit the "pause button" to allow for this work to be completed. Finally, on this Inaugural Day, I want to close with thoughts of forgiveness and renewal. These are important words for those of us opposing the CPSIA. With a new administration in place, regardless of the politics, we can move for a fresh start to appropriate legislation on safety. The past need not govern our future in children's product safety anymore than other policies of the prior Administration. It's time for a fresh start! We scream and we scream, and still find ourselves with few satisfying answers to a simple question: Are they listening? The "they" is Congress, specifically the House and Senate Committees responsible for the CPSIA and potentially for its remedy. We know others are listening, like the numerous Congressmen (Barrett, Bilirakis, Carney, Dent, Gerlach, Holden, Pitts, Platts, Ryan, Tiahrt, Weiner) and Senators (Brownback, Levin, Leahy, Mikulksi, Sarbanes, Snowe) who have expressed their concerns over this law, and the more that will soon follow. I think the CPSC hears us, too. Does Congress? If not, what's the problem? Even more outrageous, unnamed staffers are reported to have stated that no hearing would occur until an additional CPSC Commissioner was appointed, and that CPSC would be "unable" to appear at any earlier hearing. In other words, they have no intention of holding hearings in advance of the February 10 implementation date, despite the reams of data they possess on the many serious problems their law is causing. Actually, it is my understanding that the CPSC has requested such a hearing, but that request apparently fell on deaf ears. Spin, spin, spin - and then tell everyone that all discordant views are misinformation or the confusion of [fill-in-the-blank] people. Finally, to cap it off, we understand that House staffers are simply "too busy" to attend meetings with industry and the CPSC to discuss the details of the real life impact of the law. Is there a pattern developing here? Does Congress believe it can just bury this problem and no one will notice? Put your hands over your ears and your eyes, and the problem's not there, right? Why won't Congress hold hearings and let the People speak out on the record? When it comes time to have such a debate, they seem to be too busy or have other excuses to keep inconvenient opinions out of the public eye. After all, if they can keep the protests to a few frothy blogs, this will all blow over . . . right? It is ironic that the people who patted themselves on the back for defending safety, Mom and Apple Pie, are now resorting to legislative trickery to silence you, their opponents, for the crime of disagreeing. Just a quick reminder: February 10, is 23 days away. Let's not let it become National Bankruptcy Day - please keep screaming at your representatives in Congress. It's not too late - but we're getting there . . . . I had to share Emily's response to my last blog. She points out that there are other similar sites addressing the new cost of children's items. See http://www.etsy.com/search_results.php?search_query=cpsia&search_type=tag_title&page=1&order=price_desc&min=&max=. This site is hilarious but sad. The problem of ruined price points and ruined businesses is still unrecognized by Congress. No one wants to face this looming reality, all because of the marketing of the CPSIA as a needed "improvement" in safety regulation. The $4,200 children's bib on Etsy is not considered a counter-argument because, darn it, we need to be "safe". This abstract, spiritual use of the word "safe" is deeply distressing to me. If people believe safety is something abstract, as though it were a kind of window onto the soul and a measure of some sort of morality, then industrial efforts to produce safety will become completely diffuse and unfocused. Safety surveillance only works if it homes in on real, known, actual risks. If we scatter our resources over all sorts of imaginary, paranoid illusions of potential risks, there will little energy left for the real problems. We cannot afford this frivolous exercise. Please keep screaming! To start the day off with a (wistful) smile, please check out the new CPSIA children's skirt offer at http://bit.ly/cswCi. The skirt's only $15,160 but the shipping's free! Hey, don't complain - at least you KNOW your child will be safe. Can't take too many chances these days. . . .
Somebody blogged to remind me that it's really time to get the lead out - for legislators dealing with this absurd law. Yes, get the lead out - get moving and fix this law before it destroys businesses, livelihoods and the finer things in life. I am writing in response to the letter dated January 16 to Commissioners Nord and Moore of the CPSC signed by Reps. Henry Waxman and Bobby Rush and Senators Rockefeller and Pryor (January 16 Letter). See http://energycommerce.house.gov/images/stories/Documents/PDF/Newsroom/nord%20moore%202009%201%2016.pdf. In this letter, Congressional leaders urge the CPSC to clarify "confusion and misinformation" under the CPSIA in a "clear and understandable manner" and specifically, to address the application of the new law to certain books and clothing items, resellers like thrift and consignment stores and component testing and to provide guidance to small businesses. Notably, the letter counsels that "greater communication and expedited action by the Commission will improve compliance with the law and lead to more effective and efficient achievement of the law's goals." I respectfully disagree. In large part, I believe this letter mischaracterizes the nature of the problem with the CPSIA by implying that with a few regulatory tweaks and a little more guidance, everything will be "fine". This is patently untrue and misleading in itself. Furthermore, with economic conditions as they are today (see http://video.forbes.com/fvn/business/er_retailers011409 - 200,000 stores are expected to close in 2009), the negative economic implications of this law have the potential to be catastrophic without an IMMEDIATE serious reconsideration of legislative approach. See also http://www.forbes.com/opinions/2009/01/16/cpsia-safety-toys-oped-cx_wo_0116olson.html and http://www.forbes.com/entrepreneurs/2009/01/15/toys-lead-retail-ent-law-cx_rb_0115bovarnicksafetylaw.html?partner=relatedstoriesbox . By attempting to prop up a poorly-conceived law, I believe that Congress is fiddling while Rome burns. This did not work out well for Rome or Nero, and will not work out well for the United States in this case. Fixing the Law Exception-by-Exception Will Not Succeed. I am confounded by the notion that by drafting a list of exceptions, the CPSC will address the fundamental compliance issues under the CPSIA. As the January 16 Letter notes, the only permitted exceptions are those items which "do not contain lead or contain lead at levels that do not or would not exceed the law's limits" - in other words, the only exception criteria under this law is lead levels, NOT risk. This rule is the source of much of the problem, as it sweeps into the law many items and item categories that are well-known to be safe. No amount of rule-making will reconstruct an economy based on selling safe products that happen to have lead as a trace element. The diversity of products, markets and channels in our economy will defy every attempt to build a workable law that makes everything illegal without regard to risk except as defined. The absurdity of this effort is illustrated by the January 16 letter itself in which Congressional leaders request special rules for children's apparel consisting "entirely of dyed or undyed fabric", in other words hats, socks and underwear. Perhaps the requested rule will be known as the Hats, Socks and Underwear Exception. Frankly, this does not solve the problem for those of us living in cold Chicago. Likewise, the January 16 Letter's request to create exceptions for books is limited to "ordinary" books made entirely of paper - staples, glue, thread, laminates and other components of books (not apparently well-known to Congress) will make most books ineligible in this non-risk-based exception. However, all books comprised of loose sheets of paper should fall comfortably within the recommended exception. I am sure libraries will appreciate this helpful loophole. A safety law that is divorced from risk assessment cannot be fixed by exceptions. Congress needs to recognize this serious flaw in the CPSIA and take immediate action to fix it. The Proposed Actions in the January 16 Letter Will Increase Complexity. The CPSIA is already one of the most complex pieces of legislation in American history. For companies like ours which are committed to complying with law, the CPSIA presents a unique business challenge to conquer. Now Congress is suggesting that the CPSC add to the confusion by making the law even more complex with a series of detailed exceptions for various industries, channels of trade, products, features, and other unspecified circumstances. In other words, if American businesses didn't understand how the law worked before, the solution is to make it more complicated. This concept is embedded in the CPSIA, which instructs the CPSC to carve out limited exceptions for products which could not possibly violate the new standards. The legislative construct is entirely wrongheaded, as the approach to safety should be risk-based and further, is incredibly divorced from reality. For instance, the January 16 Letter does not request that resellers of used merchandise be relieved of any responsibility under the law, just that they be coached better. I suggest that Congress write a book called "How to Run A Thrift Store under the CPSIA." Perhaps then, and only then, will we understand the procedures such stores must undertake to ensure compliance when selling old merchandise. Complexity itself is the enemy of compliance with law. Even a simple rule like the lead-in-paint ban has proven surprisingly resistant to universal compliance despite the fact that there is no economic incentive to use leaded paint in children's products. [Notably, as violations of the laws prohibiting murder illustrate, compliance problems are not unusual in American jurisprudence and are certainly not restricted to children's products companies.] Under this new legislative regime, the blazingly complex CPSIA and its attendant CPSC exceptions, rules and regulations, FAQs, opinions, interpretations, private letter advice and so on will make compliance with law a false promise to the American people, and at the same act as a high-octane stimulus package for the legal industry. Even if more $600-per-hour lawyers is a good thing for our economy, I rather doubt this will be a workable solution for any American business, including the largest, wealthiest and most sophisticated companies. For perspective, I suggest you contact the legal department of your nearest thrift store for their opinion. The Approaching February 10 Deadline is Incredibly Unrealistic. The January 16 letter posits a fantastic resolution to the CPSIA problem, namely that the CPSC should just issue a lot of rules and regulations in the next few days to resolve the painful concerns expressed by constituents of late. Even if this were possible, the idea that it would resolve the issue is, frankly, delusional. The United States has literally hundreds of thousands of businesses affected by the CPSIA. They tend to vary in size and sophistication and many depend on a small, low-cost labor force. Despite the outpouring of concern over this law, Congress has heard from only a miniscule percentage of the affected businesses - many of the silent companies are very likely oblivious to the law and its implications. Is the concept here that when the CPSC issues a stack of rules a few days ahead of the deadline, every affected business will instantly and perfectly absorb the news, properly interpret the regulations and their application to its economic activity, rejigger processes, repair damaged relations in its supply chain overnight, and so on? I think the timeline of public reaction to the CPSIA since the law was written and signed into law informs us that this is a wholly unrealistic scenario. A series of rulings by the CPSC in the next few days will not do much to stop the economic carnage. About the only remedy that the CPSC can implement before February 10 to stop this train wreck is a broad STAY OF ENFORCEMENT. The solution of a stay ("hitting the pause button") would offer the advantage of both bringing overnight relief to the affected industries, and provide time for an open public debate over how to fix this law, whether by amendment, further regulation or some combination thereof. A stay for one year (or more) would also have the advantage of unifying the lead standards with more time to plan and sell-off inventory, thus eliminating the problem of retroactive application of the law against product with total lead levels between 300 ppm and 600 ppm which will be legal for only six months (February 10 - August 9). Congress Seems to Want to Do the CPSC's Job. The CPSIA establishes new standards for safety in children's products in a number of now well-known ways. Prior to the CPSIA, it was the responsibility of the CPSC to make a risk-based determination for safety hazards. The January 16 letter continues the new tradition of Congress in supplanting the CPSC as the arbiter of safety risks. I do not understand what qualifies Congress to make the judgment, first that books are illegal until proven legal, and then that some kinds of books are in fact okay. Did Congress hold hearings or does it have some other way to make this assessment of risk? I believe that Congress should not be in the same business as the CPSC, and by micro-managing the activities of the Commission, it has meaningfully contributed to creating the morass that it complains about today. The CPSC is qualified to manage the process of assessing safety risk and writing sensible rules for the administration of those risks. If Congress persists in looking over the shoulder of the CPSC and critiquing its judgments down to the level of buttons, snaps and other "metal, plastic or painted components", it should not express dismay over the slow, tedious and tentative process that results. Congress is teaching the CPSC that the determination of risk is a Congressional Subcommittee responsibility now. And What about State Attorney Generals? I want to point out that in a post-CPSIA world, having empowered the State AGs to meddle in and enforce federal safety laws; companies like ours are now faced with 51 CPSC’s (plus Congressional Subcommittees). Is this someone's idea of a more efficient way to run an economy? Has Congress thought about the practical effect of this change in our Federal system, or the risk that it imposes on businesses? The exponential expansion in regulatory bodies under the CPSIA increases the complexity of compliance to mind-boggling levels that outstrip literally everyone's ability to process - American businesses are in effect forced to ignore State laws because they can't manage compliance with them as a practical matter - and introduces significant externalities (uncontrolled risks) that cannot be managed in any way. State AGs do not answer to the CPSC and are now empowered by the CPSIA to take matters into their hands if, in their judgment, the CPSC is not enforcing the law. Great. See, e.g., http://www.azag.gov/press_releases/dec/2008/Mattel%20CJ.pdf. In Eighth Grade, I learned about the Federal system and thought this was how the Founding Fathers intended to organize our economy for maximum efficiency and equitable treatment under the law. I believe the CPSIA has rendered my Eighth Grade civics education obsolete. We are nevertheless hopeful that Congress will act before the CPSIA makes our company obsolete, too. While I appreciate the hard work and good intentions behind the CPSIA and its passage last summer, the time has come to stop defending a defective bill and its defective process and acknowledge the reality of the law's weaknesses. I am personally convinced that there is more than one way to legislate improved safety in children's products, and that the CPSIA can be safely amended without ripping the fabric of our society. A revised bill can be built to strike the problematic overly-broad provisions that contribute nothing to the safety of children's products, and replace them with a simple, sensible, risk-based approach that will provide reasonable assurance of the safety and appropriateness of children's products in our economy. We are facing a historic economic crisis in our country. It is time for non-partisan leadership to bring our country out of this terrible situation. The CPSIA is part of the problem and needs to be fixed. I urge Congress to face this reality, stop blaming the CPSC for a doomed attempt to make a defective law workable and get to work on amending the CPSIA for the good of our country. I highly recommend that you read George Will's article entitled "Litigation Nation" at http://www.washingtonpost.com/wp-dyn/content/article/2009/01/09/AR2009010902353.html. In this article, he talks about the "bubble wrap approach to child rearing" and a "cult of safety". Ring a bell? Call me cocky, but I think I understand plain English. English is my first language (my only language aside from the residue of long ago High School French) and I feel like I always have a fighting chance to understand English text, spoken or written. Unfortunately, I seem to be processing English rather poorly nowadays, at least to judge by my ability to get my head around the proper interpretation of the CPSIA. Congressional leaders claim in writing that there is so much "misinformation" circulating about the law, inducing panic over this wonderful, ground-breaking legislation, that must be corrected. Darn, shame on those people spreading misinformation! Presumably to assist in correcting all the misunderstandings, we are instructed by the CPSC in the following video to not to worry, all will be well. http://www.wbaltv.com/video/18479590/index.html. a. As of February 10, all inventory is subject to the new 600 ppm total lead standard (including existing inventory). b. Retailers do not have an obligation to test existing inventory for compliance. c. As a consequence of point a., however, any sales of items violating the lead standard are subject to the full brunt of this law. d. Retailers should simply exercise business judgment in determining what violates the law and what doesn't. She suggests calling the manufacturer (hey, thrift stores, that sounds like a great idea for you!) or just eyeballing the thing. Oh yeah, the thrift stores can also buy a XRF gun for $50,000 or rent one for $1,500 per week to check used sweaters for lead. The average selling price of a children's garment in the thrift store in the video clip below is $1.25, so a $50,000 instrument will just blend into the cost structure of an average thrift store, no prob. Okay, I get stuck at this point. You are on the hook for selling something in violation of the CPSIA standards (it is a "knowing" violation if you did not exercise the "due care" of a "reasonable man", see 15 USC 2069(d)), but you have no obligation to test and can just "guess" whether the product is in compliance. But if you guess wrong, they reserve the right to hammer you. Julie Vallese says this with a smile on her face like we will all understand and take comfort in these words. I don't think it's her fault that she has to defend something that just is indefensibly convoluted - the CPSC didn't write the law but is bound to enforce it regardless of whether it makes ANY sense - but I can't share her sunny confidence that everything is "fine" now. When the first store gets hammered for guessing wrong (Get ready, get set, GO Consumer Groups! Protect us, protect us!! ), how useful will Julie's advice seem then? In some ways, the advice of the CPSC is practical - what choice does a thrift store or other retailer have over its existing inventory? We all have to soldier on - the advice of the CPSC seems to be just breathe deep and take a chance on violating the law. Now that's the spirit - let's stop worrying so much, complying with the law is for small-minded people anyhow. One last thing, the video below accompanied the Julie Vallese interview on WBAL-TV. Please note at the end the reporter states that the CPSC has 100 field investigators - and they will all be out on the street on February 10 presumably looking for you! I suggest you have the milk and cookies ready to make them feel at home. I wish I understood English better. Clearly there's something I just don't get. Isn't there? Don't worry so much - We are TOTALLY on Top of This Situation! I just want to reassure you that based on the below recall, we have decided out of an abundance of caution to test all of our products for the presence of peanuts. A Virginia company that makes peanut butter for institutional use is recalling peanut butter made at a Georgia plant after health officials linked it to a salmonella outbreak that sickened at least 425 people in 43 states and may have caused three deaths. Peanut Corp. of America, Lynchburg, Va., said it is recalling products made after June 30 at its Blakely, Ga., processing plant. The company sells bulk peanut butter under the King Nut and Parnell's Pride labels. The products are not sold at retail stores, but at food services and institutions such as schools, hospitals and nursing homes. "We deeply regret that this has happened," Stewart Parnell, owner and president of Peanut Corp., said in a news release. "Out of an abundance of caution, we are voluntarily withdrawing this product and contacting our customers. We are taking these actions with the safety of our consumers as our first priority." The company recalled the peanut butter Tuesday after the federal Centers for Disease Control and Prevention identified it as a likely source of the outbreak. On Monday, Minnesota health officials confirmed that salmonella found in a five-pound container of peanut butter genetically matched the bacteria involved in the nationwide outbreak. The peanut butter was made by Peanut Corp. for King Nut Cos., Solon, Ohio, which voluntary recalled its products Saturday. The CDC said people in several states became sick after eating at institutions such as schools, hospitals and nursing homes hospitals, which only used King Nut brand peanut butter. The CDC and states continue to investigate the cause of the outbreak. The Food and Drug Administration said Monday night it was inspecting facilities at King Nut and Peanut Corp. to gather samples and collect records. 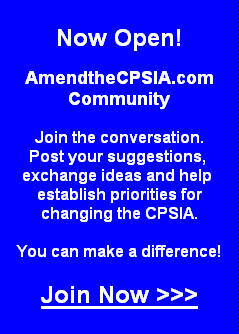 Subject: CPSIA - "What do we do?" In my continuing effort to keep you informed about real world attempts to live with the CPSIA, I wanted you to see the below correspondence with one of Learning Resources' sales reps. As a bonus, the email trail includes the Wall Street Journal editorial published this morning entitled "Pelosi's Toy Story". This correspondence is the reality that we, and many thousands of other businesses, currently face. Many distributors and retailers are ignoring the new standards being imposed on February 10 and going directly to the August standards. This has been predicted in writing to you in earlier correspondence. While I am sure some people will be rubbing their hands in glee, with visions of greater "safety" as early as four weeks from now, companies like ours are in legislation-induced disarray. We have no choice but to skip to the new August standards. Is that fair? Didn't Congress want to give us time to make that transition? Sell off our inventory, blah blah blah. Well, the marketplace is jumping ahead, so we have no such choice or flexibility. And WHY is this happening? It's obvious and it's old news - the September 12 opinion of Cheryl Falvey, General Counsel of the CPSC, states that the lead standards will apply to existing inventory upon their effectiveness date. In other words, the law makes existing inventory in August subject to this same retroactive effect on the new, lower standards. Stores now are refusing to buy anything not certified to this standard now to avoid problems later. We do not regard this as an economic stimulus package. And how do you expect us, in the real world which is where we reside, to deal with this dilemma? I hope you are not thinking "That's a market issue, not a legal issue - just tell them that the standards don't go into effect until August. This isn't Congress' fault." If you did have that thought, even for a second, you are in denial of reality. Out here in the real world, the customer is always right. In our case, please accept that it is impractical for us to segregate our customers into categories like (a) customers applying August standards, (b) customers applying February standards, and (c) customers who don't care or haven't heard of the law, and manage our inventory accordingly. So customers like The Doll Hospital below have a huge impact on how we have to run our business. While you may think this is not your fault or your problem, I beg to differ. I think you had something to do with the law that created this mess. Welcome to our world. At this point, we are looking to hire experts in Chaos Theory. Thanks for sharing this email. You are of course entirely right to be concerned. The chaos created by this law is a problem in and of itself. I wish Congress had ears . . . . Regarding your specific question, Learning Resources and Educational Insights have conducted a thorough review of their products using XRF technology to form a reasonable basis for our continuing view that our products and existing inventory comply with the standards. We are anticipating the future standards in this analysis. We note the concern of your customer over holding inventory that might become illegal later. This shameful risk is being imposed by the government and will reverberate nationally until somebody wakes up in Washington. It is absolutely astounding to me that Congress is oblivious to the predictable response of the marketplace to the poorly-conceived retroactively-applied reducing standards. Maybe if they had to live with such standards themselves, they might get it. I wish someone would stop by the Congressional gift shop with a XRF gun just to see what they find. We will certify to the standards online and with customer communications before the deadline. Tell your customers not to worry. They also need to understand that the completely unreasonable deadlines of the government are making an orderly process impossible. Realistically, everyone must be patient. The visibility of this issue is rising, thankfully. See below. Perhaps we will live long enough for relief from the government. The current difficult transition period is a national self-imposed injury as existing inventory is not known to present a material human health risk. Write Congress every day! In the tale of "The Velveteen Rabbit," a child's stuffed toy can only become "real" once all its fur has been loved off, and it's missing a button or two. If only. Under a new law set to go into effect February 10, unsold toys, along with bikes, books and even children's clothing are destined for the scrap heap due to an overzealous law to increase toy safety. The damage comes from new rules governing lead in children's products. After last year's scare over contaminated toys made in China, Congress leapt in to require all products aimed at children under 12 years old to be certified as safe and virtually lead-free by independent testing. The burden may be manageable for big manufacturers and retailers that can absorb the costs of discarded inventory and afford to hire more lawyers. Less likely to survive are hundreds of small businesses and craftspeople getting hit with new costs in a down economy. Because the new rules apply retroactively, toys and clothes already on the shelf will have to be thrown out if they aren't certified as safe. When Congress passed the legislation in August, House Speaker Nancy Pelosi boasted that "With this legislation, we will not only be recalling, we will be removing those products from the shelves." Yeehaw. While large retailers may ask manufacturers to take back uncertified products, independent stores may be stuck with inventory that is suddenly illegal to sell. One Web site, NationalBankruptcyDay.com, is cataloging the costs faced by small businesses. Small batch toymakers, many of whom make old-fashioned wood and sustainable products, say the testing requirements -- which can cost thousands of dollars -- are unaffordable. At Etsy.com, a Web site where entrepreneurs can sell their handmade items, many expect the new law to put them out of business. Also ensnared are companies that make products like bikes or childrens books. Because they aren't toy companies, many were caught by surprise when it became clear the law would apply to them. The only lead that can be found on childrens bikes is on the tire, where it poses no risk to a child not in the daily habit of licking the wheels. And while childrens books may contain no more noxious materials than paper and ink, under the new rules they would still need a test to prove it. Responding to the uproar, CPSC has issued a rule-making notice that would exempt natural materials from having to be certified as lead-free -- but it will need to go further to avoid an economic trainwreck in February. The real responsibility lies with Congress, which rushed through "kid-friendly" crowd-pleaser legislation without considering the consequences. Despite warnings from small businesses, Illinois Representative Bobby Rush and California's Henry Waxman pushed provisions that now require pulling products from the shelf. Mr. Waxman demanded lead standards without allowing compliance to phase in. Now even their allies are skittering away from strict enforcement, fearing the looming fiasco could force Congress to amend the bill. Last week, consumer groups that once flogged the law, including Public Citizen, Kids in Danger, and the Naderite U.S. Public Interest Research Group, wrote a letter urging the CPSC to "take the initiative . . . by providing prompt, common-sense, and explicit interpretations regarding exemptions to CPSIA." Now they tell us. Congress has beaten down the CPSC for allegedly not doing enough about toy safety, but last year's toy law was an election-year overreaction by Congress. The Commission needs to implement the rules without putting more companies out of business in an already tenuous economy. Subject: FW: CPSIA Requirements - What do we do?????? I am starting to be more concerned about these safety laws more than the economy. We are starting to get this type of request from our customers. (Below). It seems everyone I talk to have a different version of what is exactly happening come February 10. And will the toys on the shelves of our stores be OK to sell? Will the toys on your shelves to OK to ship. Any info you have would be greatly appreciated. Thank you in advance. I am sure that you are well aware of the new CPSIA requirements* regarding legal limits for the allowable lead content in any product intended for children age 12 and under. We believe your company has probably already done extensive testing for lead in all products you have sold us; however, we need to obtain written confirmation of this. It serves our mutual interests to work together to classify all such on-hand product, as to your company’s degree of certainty that they are not hazardous products under CPSIA. We are looking to get compliance information on all products that we currently have in stock that may have been produced or imported prior to November 12, 2008. Attached you will find a report listing all of the Best of Best items that we currently have in stock. We need you to complete this form providing us with all of the compliance information for each individual product. It is very important that you advise us immediately on any non-compliance with the new requirements. Since many of the products that we have now and will be receiving in could remain in inventory after August 14, 2009, we must go directly to the CPSIA@dhtss.com within the next 10 days. We appreciate your immediate attention to this matter. Please feel free to contact me directly with any questions. *Any product that is produced or imported into the USA after November 12, 2008 must have a Certificate of Compliance (COC) that it contains <600ppm of total lead. After February 10th, we must be able to provide comprehensive laboratory testing for each product to show that total lead is <600ppm in every part of the product. After August 14th, the allowable total lead is reduced to <300ppm and the lead in surface paint must be <90ppm. We are being heard. Keep screaming! The CPSIA presents puzzles for those intent on complying with its terms. I mentioned one perplexing consequence of the CPSIA in my letter entitled “CPSIA Problems Seem Endless” dated January 12, namely that the rules for total lead can apply differently for a manufacturer and its dealer for the VERY SAME PRODUCT. In that letter, I noted that an industrial product would not subject the manufacturer to CPSIA lead standards for good reason, as the product is not intended for children 12 years of age or younger. However, if the manufacturer sells the product to a dealer who puts it in a catalog that he then mails to schools, the dealer becomes subject to the total lead rules. The common understanding of the CPSIA rule defining a Children’s Product depends entirely on intent, in other words, what is in your heart and in your business plan when you offer the product for sale. The nature of the product does not govern the application of the new lead standards. In this particularly case, since the manufacturer is objectively free of testing obligations and the dealer is objectively subject to the testing standards, the law creates an immediate conflict in the supply chain. Since it is likely that the dealer sells only a small volume of the distributed product (and therefore cannot afford to test the product profitably) and because the manufacturer will lose very little business by refusing to test the product, this industrial product will be dropped from the school catalog. There is no information here to suggest that the product was not safe by any definition. We’ll never know, because no one will test it, and commerce in this item will stop in the school market. These small stories are meaningful, especially when viewed in the aggregate. These battles in the marketplace are a direct result of the disruptive effect of a poorly designed rule. The definition of Children’s Product should be objective, so that all sellers of the same product are subject to the same rule. The principal reason for this change is that an intent-based law creates too much confusion and dislocation. Either a product is for children or it’s not, and what you think when you sell it should be irrelevant. If intent is essential to the definition, the result will be a smaller economy or a CPSC that will never cease issuing rulings. The CPSC, by the way, has had objective rules in place for many years governing age grading. Age grading is essentially a tool for deciding if something is a product intended for children. The confusing addition of the overly-broad definition of Children’s Product makes the rule on age grading harder to comprehend, and will create lasting confusion among companies attempting to sort out how to comply with law. I do not think this is good public policy and will reverberate in our economy for some time to come. One common misconception is the debate about the CPSIA is that the current furor relates simply to February 10, the notorious “National Bankruptcy Day”. Actually, I think that’s just the beginning of the misery. While the frictional transition issues brought upon us by the September 12 legal opinion of the CSPC General Counsel will eventually pass, the costs from testing will soon begin to mount. After that, the monumental, suffocating and expensive chore of lot markings will kick in to do their economic damage, too. These elements of the CPSIA will cause many small decisions to be made. This letter sets out one of the change mechanism. Imagine decisions of this nature, times a million or ten, and then you may begin to see the true negative impact of the new law. I need to note that this law is supposed to be about SAFETY. The above discussion notably has nothing to do with safety. Why? Because the misery caused by the CPSIA has never had anything to do with safety. No one can rationally argue that the enormous spectrum of affected products and industries have a long record of personal injuries caused by lead. There is simply so such data available. It is therefore no great leap to grasp the enormity of the economic calamity – we are going to severely distort our economic decisions because of legally-mandated waste of precious capital and suffer major losses all in the name of safety, although no one can link these activities with any actual safety risk. Theoretical safety risks are not worth the destruction of countless markets. I call on Congress to take immediate steps to substantially revise the CPSIA to protect markets while providing reasonable assurance of safety for children. Subject: CPSIA - Who Will be Left Standing? I wanted to draw your attention to the following small business: Hands and Hearts, a homeschooling education company located in Greenwood, South Carolina, and one of Learning Resources’ valued dealers. This company apparently makes a range of proprietary History Discovery Kits which have been sold to homeschoolers safely and appropriately for some time now. Unfortunately, our friends at Hands and Hearts have concluded that the CPSIA effectively outlaws the sale of these items and is discontinuing them one day before the new standards take effect. See their notice below. I understand that some people feel this law is “misunderstood”. With only four weeks to go before implementation of the new standards, that seems to quite a failure to me. Congress wrote this law to change the rules on children’s product safety yet even five full months after the law’s passage on August 14, “misunderstandings” abound. I think you know by now that I do not share the view that Hands and Hearts or the other opponents of this law misunderstand anything. It is important to distinguish between making legitimate criticisms of the CPSIA and “misunderstanding” the law. The words in the law have only one meaning, and if Congress thought that the CPSC would clarify everything to avoid these “misunderstandings”, it made a big miscalculation. How so? The law is actually quite clear. The folks at Hands and Hearts get it. Many people get it. Does Congress? I hope the Rush Subcommittee will start to take the deep expressions of pain of U.S. citizens and U.S. businesspersons seriously – and soon. The damage illustrated by the Hands and Hearts situation CANNOT BE ALLOWED TO CONTINUE. It is with the deepest possible regret that we must announce that we are discontinuing production of our Hands and Hearts History Discovery Kits. We, like so many other small business in America, are simply unable to afford to get in compliance with the new Consumer Products Safety Improvement Act.We know that these kits have blessed thousands of homeschoolers around the world, and we have prayed, wracked our brains, and sought council in hopes that we would not need to take this step. As of today, the prices of our kits are discounted. We will discontinue the sale of these kits on February 9th, or when current stock is depleted, whichever comes first. We do honestly believe that amendments will be made to the CPSIA, and it is our hope that these amendments will be reasonable enough that we will be able to offer our kits again at some point in the future. We want to absolutely walk in integrity, so we want to be clear that while we HOPE to be able to offer these kits again, we simply cannot guarantee that we will be able to do so. Only you can decide if you want to buy a kit now so that you know that you will have it, or whether you are comfortable waiting and hoping with us. It is also our hope and intent to leave our store open after Feb. 10, but the loss of revenue from our kits may force us to close our business entirely. If it is important to you to purchase anything from us, please consider doing it now or you may be unable to do so in the future. This law affects MUCH of our inventory, and there are many, many products which are being discontinued by their manufacturers. As a result, we will not be able to reorder any of those products once our current stock is depleted. We would like to urge each of you not to buy in a panic, but to pray about what you need to do. Please read this article [http://handsandhearts.com/index.asp?PageAction=Custom&ID=98] that I have written. It contains an overview of the CPSIA and a detailed action plan with steps that we can take to try to get this over-reaching law ammended. Please let other homeschoolers know both about the above article and about our sale. It saddens us to know that we cannot reach everyone and that there will surely be many homeschoolers that come to our site too late and are unable to purchase kits. We will be continuing to send updates and breaking news about the CPSIA and the status of our company through our newsletter, so if you are not a subscriber please use the form in the left-hand side of our website to subscribe. IMPORTANT: Shipping times WILL be delayed due to this sale. If you need your order within a certain time frame, let us know and we will try to accommodate you. As we sell out of kits, they will be removed from the website. As I wrote on my blog, we know that the king's heart is in the hands of the Lord, and that He works all things together for our good. We can't see it rigt now - we just have to believe. We are sure that there will come a day that we will be able to give God the glory for all the ways He worked through this situation, but right now we can give Him praise for Who He is. a. Disruption of routine trade. In this case, libraries make the legitimate point that lending books is a form of selling. If you can't sell a book violating the CPSIA, presumably you can't lend it either. That implies no more libraries. This fits well with the well-documented future absence from the marketplace of telescopes and microscopes. As a member of the education community, I have a deep concern about the disruption of our education system under the CPSIA and am shocked that Congress seems so immune to this direct threat to our elementary educational system. b. Chaos in the marketplace. The article cites a demand from Amazon.com to its vendors for certification by January 15 or face a mass return of merchandise - all at the vendors' expense, of course. Given the billions of dollars of trade with Amazon, this is presumably a serious concern to many companies. It also represents a golden opportunity for Amazon to lighten up on inventory after the holidays (nice for them). You have previously been advised of similar moves by other mass merchants. This will result in all-out commercial war and almost certainly major litigation, starting soon. c. Counter-intuitive rules being imposed under the CPSIA. The very notion that books are a potential health hazard has many people scratching their heads. A reasonable question is raised: How did Congress become aware of a major national health risk that the trade, the public and the CPSC didn't know about? How did that knowledge make its way to Congress without any publisher finding out? Of course, this is not the only industry facing head-scratching rules. The thrift store industry, even after the recent advice from the CPSC, is left in a perilous position. I can assure you the education industry is in disarray, too. [I have raised the issue of science education numerous times in numerous settings.] The implementing rules have people asking why so many items are being regulated even though the CPSC acknowledges that they are very likely lead-free. This problem flows from an overly-broad law. d. Confusion, confusion, confusion. It seems that many people are deeply troubled and confused about the law. Many legitimate questions have been posed because the law prohibits many normal and safe activities. The CPSC seems to be the party to blame this week. Nonetheless, it appears that confusion is persisting. Could this relate to the law itself? Is it really clear that everyone who is protesting this law is somehow unable to read and understand the law? Is that explanation plausible, or is that belief simply a refusal to face reality? "(d) “Knowingly” defined. As used in the first sentence of subsection (a)(1) of this section, the term “knowingly” means (1) the having of actual knowledge, or (2) the presumed having of knowledge deemed to be possessed by a reasonable man who acts in the circumstances, including knowledge obtainable upon the exercise of due care to ascertain the truth of representations." This definition of "knowingly" means that due care must be taken by anyone to avoid penalties under the law. "Due care" is a serious obligation and a serious undertaking. This is why there is a national shortage of XRF guns now, as panicked manufacturers and retailers attempt to cover this due care obligation 24/7 with February 10 rapidly approaching. Libraries presumably need to scan every book to comply with the CPSIA. No one can safely or appropriately "guess: whether their goods comply or not under the CPSIA. I feel sorry for thrift stores. I hope the magnitude of these problems will eventually overcome any pride of authorship in this law, and lead to action in resolving these issues. A lot is at stake. Congress bans kids from libraries? On February 10, the new law gets teeth. After that day, all products for children under 12 — books, games, toys, sports equipment, furniture, clothes, DVDs, and just about every other conceivable children’s gadget and gewgaw — must be tested for lead, and fall below a new 600 part-per-million limit, or face the landfill. Thanks to a September 12 memo from the Consumer Product Safety Commission (CPSC), the lead limit applies not only to new products, but also to inventory already on store shelves. “Under this new regime, you are suspect until proven safe,” says Allan Adler, the American Association of Publishers’ vice president for legal and governmental affairs. As the February 10 deadline approaches, the CPSIA has been causing increasing consternation — and, at times, hysteria — among makers and sellers of children’s products, who are just beginning to realize the financial and logistical nightmare they face in trying to comply. Lead testing promises to be expensive — from several hundred to several thousand dollars per test, depending on the product. And each batch of each item must be tracked and tested, making compliance brutally expensive for items with small runs. The CPSC has not issued any ruling on whether libraries, schools, and other institutions that loan — rather than sell — books will be subject to the law. Without such clear guidance, says Adler, schools and libraries should assume they have to comply. Regardless of whether libraries and schools are affected, the CPSIA is poised to take a massive bite out of the book industry. Large retailers are beginning to demand that publishers comply, even in advance of the law’s deadline. This Wednesday, Amazon.com sent a general letter informing its vendors that, if they did not certify their products by January 15, the items would be returned at the sellers’ expense. Like their peers in the toy and garment industries, many sellers of children’s books are just beginning to try to understand how the CPSIA will affect their businesses. Libraries may yet escape unscathed. The CPSIA is changing rapidly as the CPSC scrambles to clarify the confusing lead law before it goes into effect. Thrift stores, consignment shops, and other used-goods stores got a partial reprieve yesterday in a hastily drafted CPSC memo: While resellers still face stiff civil and criminal penalties if they sell lead-contaminated items, used goods will not have to be tested for lead. Which prompts the obvious question: If other children’s products aren’t likely to contain lead, why is the CSPC regulating them?